⑴ Quality means doing it right when no one is looking. ⑵ It is quality rather than quantity that matters. ⑶ Quality is never an accident. It is always the result of intelligent effort. ⑷ Customers don’t measure you on how hard you tried. They measure you on what you deliver. ⑸ Quality isn’t expensive it’s priceless. ⑹ Quality is remembered long after the price is forgotten. 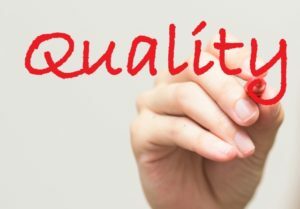 ⑺ Quality begins on the inside and then works its way out. ⑻ Quality is everyone’s responsibility and we never have to stop getting better. ⑼ Without great quality it does not matter what something costs. ⑽ Stop spending quality time with unqualified people.